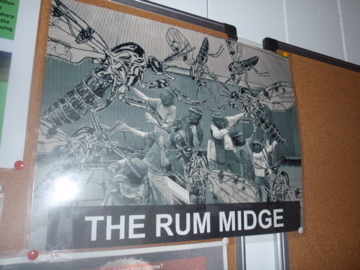 On the wall of the visitor centre on Rum is a poster entitled ‘the Rum midge’, which illustrates people under attack by a swarm of giant midges. It’s like something out of a horror movie, but the poster isn’t ironic: the midges on Rum are that bad. There are midges, and then there are Rum midges, famed for being the most aggressive of their kind in Europe. The island is a midge factory. Rum’s wet, grass and heathland landscape is ideal for the midge larvae, from which billions of the critters are produced. Against this kind of quality and quantity, the camper has no chance. I had two nights on Rum. The first was bad. It couldn’t get any worse, I thought. But I was wrong. Night two was far, far worse. They came a couple of hours before sunset on the first night, setting about me like they truly despised me, like I had somehow wronged them. I escaped to my tent. I had no alternative. Stay outside for too long and they will force any man insane. They surrounded me. I could see their little black bodies, thousands of them, crawling all over my tent’s outer sheet. I dare not open the inner sheet, for they would gleefully pour in. My tent was a graveyard of midges by the morning, with countless little bodies strewn across by belongings. A little olive oil bottle I’d left outside was encrusted with the devils. I didn’t see another midge until later that day, again not long before dusk. A breeze will tend to keep them away, but when the wind dropped for some minutes, I knew trouble was brewing. They suddenly discovered me, swooping on me in a grey ball of fury. I dived into the tent, but knew I would have to emerge to retrieve items I’d left outside. I stepped into a cloud of the monsters, seemingly furious that I’d had the audacity to run from them. They attacked me with gusto, coating any area of exposed skin – hands, legs and face. I don’t mind being bitten; it’s the sensation of them on my skin that I can’t stand, as well as the inability to do anything about it. I dashed to grab my belongings, waving my arms about my head like a maniac, and charged for the tent again. I tossed everything inside and hurled myself in, hurriedly zipping up. I was sweating with disbelief. How could the Rum midges be so bad? I hadn’t believed the horror stories, but here was the proof: they were even worse than the stories. How I despised them, the wretched creatures. An awful reality dawned on me. In my haste to get into the tent, I had neglected to brush the midges off my body. Now I saw them, hundreds of them, crawling over my legs and arms. I could feel them in my hair. How could I be so stupid to allow them to get inside the tent, the place I had to sleep tonight? There is simply no way I can stay here, I thought. 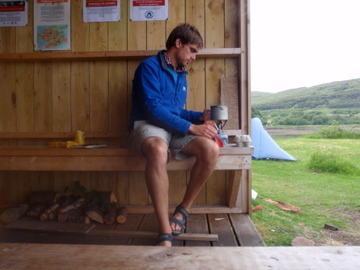 I contemplated abandoning camp and running to Kinloch Castle to beg for a bed in the hostel. Let the midges have the tent, I reasoned. I quickly thought better of it, and instead commenced a process of mass slaughter. As they attacked me, I attacked them, arming myself with books, maps, clothes, whatever I could lay my hands on. It seemed hopeless, like I was attempting to turn back the tide. But after several minutes, I was definitely winning. I was making headway. Fyodor Dostoevsky could never have known that a copy of Crime and Punishment could serve such a purpose. 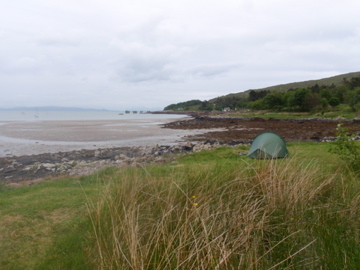 The tent was again surrounded by the incessant and eery buzz of countless midges but at least they were outside. I knew I could never eradicate them all, but after 20 minutes of bashing, slapping and swotting, I was satisfied that I’d broken their spirit. When I eventually fell asleep, it was a slumber disturbed by unpleasant dreams of insects: midges, flies and beetles, all of them scurrying about me.